Sharikay spent her youth in sunny South Florida and the first part of adult life working in the worlds of fine art and marketing. The corporate city life and polished pavements of Chicago, New York and London turned into more than a decade of life traveling dusty African roads, beaches of Central America and ancient alley ways of Asia. The end result…a radical shift in life’s focus and future. Amidst this shift, a new found committed connection to yoga was made, that has stayed in the forefront of life. With an unquenchable enthusiasm for learning and life, Sharikay has learned much from her dedicated students and talented teachers from around the globe in many disciplines – including Hatha, Iyengar, Anusara, Ashtanga, Budokon, Acro, Ayurveda, Vinyasa, Partner, Pre-Natal, Yin and Children’s Yoga. A Yoga Alliance E-RYT 500, RCYT and CEP, Sharikay is a ‘big kid’ at heart who holds space for her students (no matter the age!) to practice with integrity, intelligence and authentic inquiry helping them discover their own inspiration, courage and clarity. 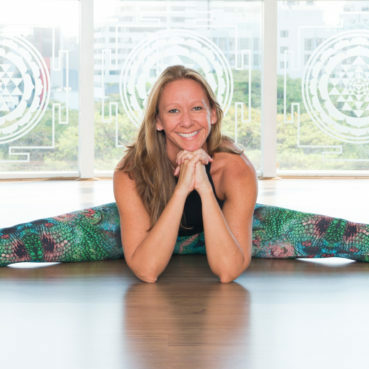 She has been teaching adults at Yoga Elements Studio in Bangkok and is Director of Incy Wincy Yoga Thailand, managing & training a talented team of teachers, and creating & supervising kids and teen yoga programs at Bi-lingual & International schools. Sharikay is forever grateful and inspired by the knowledge of her teachers, the creativity of her students and the kindness of her ‘kula’! We all began Yoga together to support a colleague with sciatica. Toss up between Indian and Lebanese. 4 year olds and 80 year olds; They are wise, kind and have no filters.